the Wheels quite a lot – 44 front and 21 types of rear. To put these wheels on other brands of cars is purely a matter of taste. 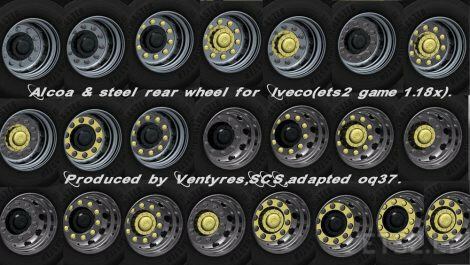 Wide wheels and tires marked with the letter W.
On default Iveco car Stralis quite possibly may be very widely to stand wide tires, and on the Highway normally. This osobennosti Stralis from the creators of the ga.
Why again old Stuff from years ago??? We are on 1.26 !!!! !